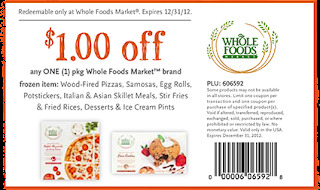 Whole Foods has a new printable coupon for $1.00 off anyWhole Foods Market™ brand frozen item: pizza, skillet meal, appetizer or dessert. And, if you have a little one, there is also a coupon for $2 off any one package of 365 Everyday Value Diapers or Training pants. Both coupons expire 12/31/12.